The garden is starting to come together. I’m feeling inspired to keep better records as well (more on that below). The first round of peas and the garlic are going strong. The fennel, spinach and lettuce starts have all been planted. Last night we transplanted most of our onions, though I’m starting to feel we may be a bit late on those. Now if we can only keep the turkeys out of them (they have this crazy obsession with all things onion). The potatoes are planted and we got the irrigation hooked up in the experimental potato bins. Our warm season stuff is also looking good. This past weekend I transplanted everything in flats into 4″ pots so they can grow a bit longer before being put in the ground. 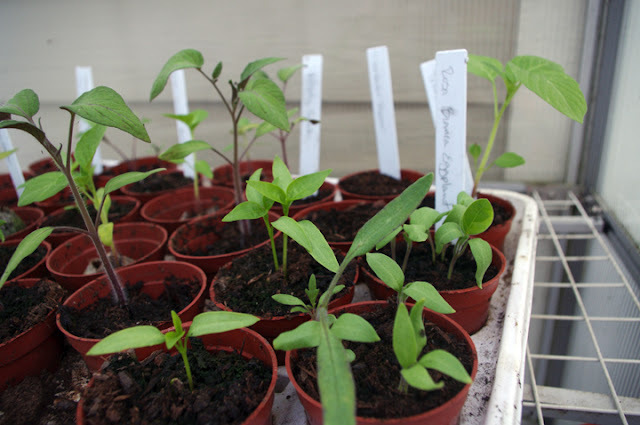 It’s not quite warm enough at night yet to risk putting them out so in the greenhouse they will stay. Speaking of greenhouse, this year it’s tied down so I’m hoping to avoid any and all mishaps that we had last year (wind storm knocked it over destroying all my seedlings). I’ve also made sure to label everything this year, which is something I’ve never done but regretted not doing every year. There is this awesome website I found that really helps with determining frost dates. I find it really helpful for the Bay Area since we have so many micro-climates and frost dates can vary dramatically within just a few miles. Actually in our neighborhood it varies quite a bit as we can be frost free at our house but just a couple of blocks away cars are covered in frost. My city is never on a list for frost dates so I always just had to guess based on the frost dates from a nearby city. I had thought they were from November 11th to March 27th. Turns out our frost dates are actually (and these are very conservative dates) December 11th to February 29th, which means I get an extra 2 months of growing time. Since our weather seems to be more and more erratic (last year we had unusually high rainfall very late into the season and this year we’re not getting any rainfall) I’ve decided to keep better track of what’s going on and I’ll be tracking our frost dates. I also want to see the blooming patterns of our fruit trees and keep a log of when and where I plant stuff out to see if making changes helps or hurts our harvest. 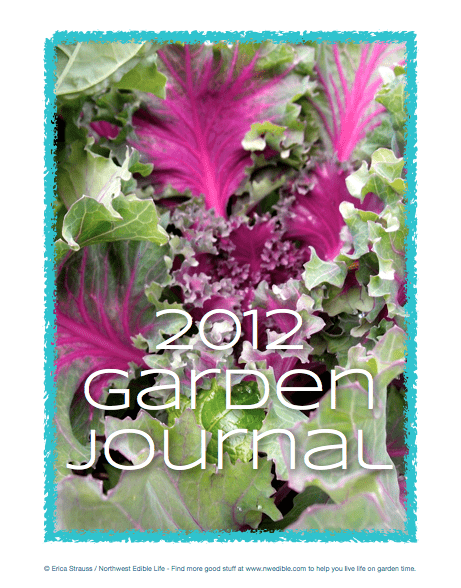 Just in time, Erica at Northwest Edible Life puts up her 2012 Garden Journal. I pretty much never buy garden journals because they are targeted towards small scale flower and maybe a bit of vegetable gardening. They never offer enough space for me so I pass on getting them. Because of this I just never really kept any notes – which really isn’t a good thing. I don’t really remember when I planted carrots 3 years ago (and got a bumper crop of them). But now, with Erica’s garden planner this will no longer be an issue. Because it’s a pdf I can pick and choose what pages to print and how many of them I need. What I really like about it is that there are different versions of pages – one more detailed and the other a simpler version – that you can choose from. And it has everything including a place to keep track of weather, monthly check lists, and project planning. It also includes pest notes and a harvest log. As an added bonus she has included spine labels for binders, a binder cover and dividers with beautiful color photos along with instructions on how to use the journal. So go check it out and get one! I know I’m going to be a better gardener because of it.